Visitors to the "It's in the Cards" exhibit and to the April 23 Art Party are invited to thumb through the unaltered cards and select any that inspire them, take them home and decorate them, then return them to the exhibit. Decorated library cards from the exhibit will be displayed in an old wooden card catalog cabinet. 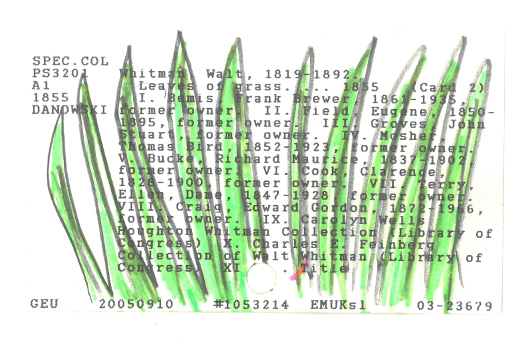 Thursday, April 23, 4:30-7 p.m.
Open to Emory students, faculty and staff and the wider Atlanta community, this is a free event to kick off the exhibit of transformed library catalog cards. Art supplies, snacks and music will be provided – just bring your creative flair. Jones Room, Level 3 of Emory's Woodruff Library. Parking available in the Fishburne deck. 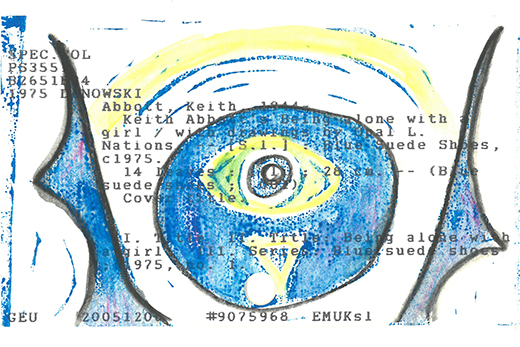 "It's in the Cards," an interactive, expanding art exhibit at the Robert W. Woodruff Library at Emory University, features old library catalog cards that have been turned into art and poetry. Students, staff, faculty and members of the community are invited to create new pieces to add to the exhibit at the "It's in the Cards" Art Party, a free event that will include art supplies, snacks and music on April 23 from 4:30 to 7 p.m. in the Jones Room. 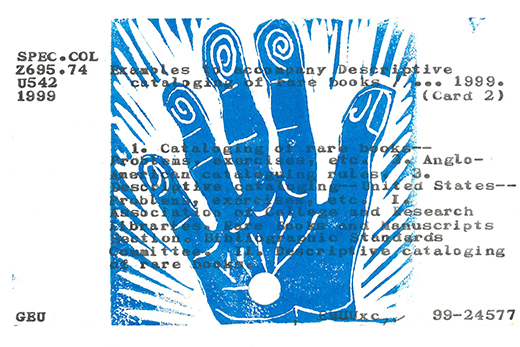 The exhibit is curated by artist and Emory Libraries conservator Julie Newton, who was approached by the Manuscript, Archives and Rare Book Library (MARBL) staff about making use of old catalog cards. 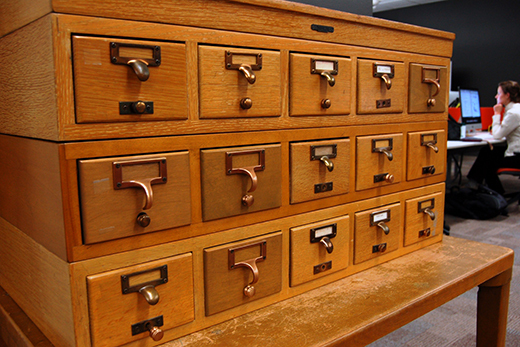 MARBL is undergoing a major physical renovation and getting rid of old items such as its wooden card catalog cabinets. Like most libraries nationwide, MARBL and the rest of the Emory Libraries have moved their catalogs online, leaving the physical cards obsolete. 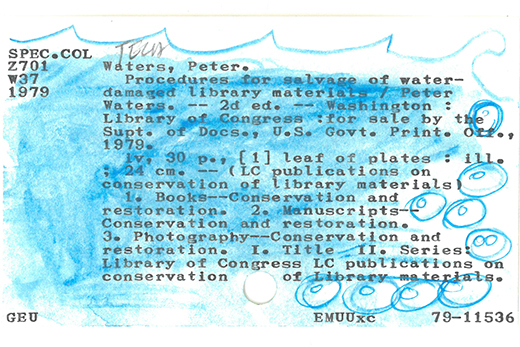 Instead of discarding the thousands of cards, MARBL staff asked Newton if she had any creative use for them and handed them off. "I thought about how MARBL is undergoing this transformation, not only to a new physical space but how it has transformed its technologies for the way that we locate books, from the physical card catalog to an online system," Newton says. "This could be an art project that would be a symbolic celebration of MARBL's transformation." Newton wants the exhibit to be composed of catalog cards that have been "transformed" by students, staff and faculty at Emory, as well as members of the Atlanta community. Everyone is encouraged to stop by the exhibit, pick up some catalog cards, take them home and turn them into art, and then return them to the exhibit. "What I hope to celebrate is the individual act of creativity – picking something up that is mostly black type on an off-white card and turning it into vibrant art," Newton says. "So my hope is to give free rein to creative expression and to see diversity of voice and visions. This is an opportunity for everyone to be an artist and for everyone to be an exhibited artist." The exhibit is expected to grow and change as submissions come in until it concludes in December 2015. The catalog cards collected from partygoers at the April 23 decorating event will serve as a basis for expanding the exhibit. 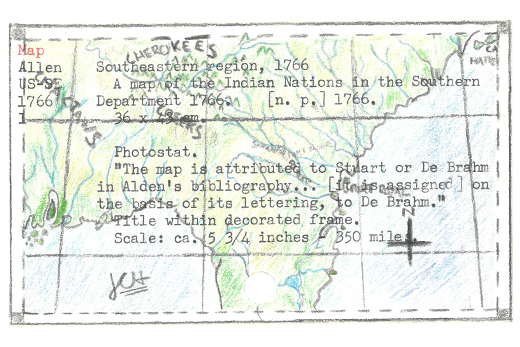 At the event, Newton will speak briefly on the project and show examples of art and poetry that she or other students have already created from the catalog cards. Then attendees can use colored pencils, stickers, paints and a variety of other art supplies to decorate cards themselves. "The event is close to final exams," Newton said. "We timed it that way specifically to get students studying in the library and give them a stress break — an art therapy stress break. Put aside the physics and come in, get a snack, and make art and have fun for a little while before going back to studying." The exhibit will display the decorated cards in the original card catalog so visitors can open the drawers and look through other people's transformed cards. 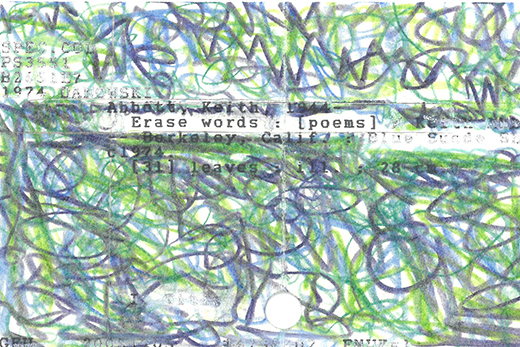 Selected creations will also be scanned and enlarged for an online exhibition and reproduced with other submissions to create a quilt of catalog cards. "The card catalog itself should draw interest from viewers," says exhibitions manager Kathy Dixson. "For most of today's students, it's a curiosity. For those of us who remember searching through card catalogs, this 'artifact' is a touchstone to memories from our past." This exhibit is in collaboration with the Creation Stories Project, sponsored in part by a grant from the Andrew W. Mellon Foundation through the Emory College Center for Creativity & Arts. "It's in the Cards" is located on Level 2 of Emory's Woodruff Library, 540 Asbury Circle in Atlanta, 30322. Parking is available in the Fishburne deck.